The full title on the original manuscript of Wagner's Siegfried Idyll reads, "Tribschen-Idyll, with Fidi-Birdsong and Orange Sunrise, presented as a symphonic birthday greeting to his Cosima by her Richard, 1870." The "Siegfried" in the title does not refer to the composer's opera of the same name, as is often supposed, but to his infant son, whose pet name was "Fidi." The "orange sunrise" refers to the color of Cosima's bedroom wallpaper, which brightly reflected the morning light. Though the work is sometimes heard in an arrangement for full orchestra, Wagner originally wrote it for an ensemble of 15 players. Having prepared and rehearsed the work in secret, Wagner gathered his small orchestra on the stairway on Christmas morning, 1870, and awakened Cosima with its first performance (Cosima's birthday was December 24; the Wagner family celebrated that day and the Christmas holiday together). Afterward, Wagner and Cosima's five children presented her with the score. As is reflected in the uncharacteristically (for Wagner) modest scoring, the Siegfried Idyll is a particularly intimate work, meant to acknowledge and celebrate the year that Wagner and Cosima could finally legitimize their union. Several stressful years had passed since Cosima had left her first husband, the conductor Hans von B&uuml;low, in 1866. The divorce was finalized at last in 1870, and in August of that year Cosima and Wagner wed.
Wagner wrote Siegfried Idyll while he was occupied with the completing and intial staging of Der Ring des Nibelungen. The music for Siegfried (1856-71), the third part of the cycle, had caused the composer great difficulty; he had set it aside in frustration in 1857, returning to it only in 1869. Wagner borrowed Siegfried Idyll's principal themes from Siegfried and Die Walk&uuml;re (1854-56), where they have specific meanings within the cycle's system of leitmotives. 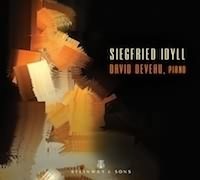 Within the context in Siegfried Idyll, however, these themes are take on a more general nature as expressions of triumphant love and affection. Wagner had never intended to publish the work, but financial problems forced him to make it public in 1877.